Detailed plans have been submitted for the new Rugby Free Secondary School building on the Rokeby field. Because it is for a school, the planning application has been lodged with Warwickshire County Council. The school has also lodged an application to build temporary classrooms on its existing site to accommodate the extra pupils it will take on in September but lacks room for. The replacement building will provide the space for these pupils and the expanding school in future years. Outline permission was granted last year for a school building on the site. This new application only deals with details about the design and placing of the buildings, landscaping and car parking, as well as traffic calming measures for nearby roads. The new school application includes plans for the new Quest Special Educational Needs School building as well. 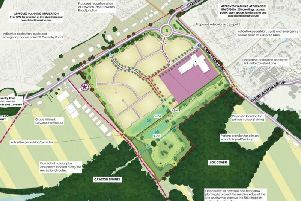 The choice of site for the new larger building caused opposition from some residents who expressed concern over the impact of the extra traffic on the local roads, and the loss of the field which has been used by locals for many years. An application had been made in September 2016 to recognise the Rokeby field as a ‘village green’. Village green status prevents land being built on or developed if people have used it freely for 20 or more years. Following hearings held last year, the inspector, Michelle Caney, recommended that the site should not become a village green. She stated that people accessing the site had either climbed over or through broken fences, climbed over a locked gate, or passed signs saying trespassers may be prosecuted and banning certain activities. Therefore their use of the field did not qualify.